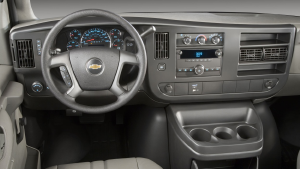 Passengers will travel in comfort and safety in the 2017 Chevrolet Express Passenger Van. It comes with standard seating for 12 or you can choose available seating for 15. You and your travelers will enjoy the ride with available safety features like a rear vision camera and technology like available built-in 4G LTE Wi-Fi® that will keep you connected. Affordable group travel is made possible with the 12-passenger extended van from Peter Fuller Rentals & Pre Owned, serving the Boston area. These spacious models feature a sleek profile and are built for big groups and their belongings. These vehicles accommodate longer trips with split seating and middle aisle design, reclining chairs with headrests, extra headroom for tall passengers, and additional storage space, so riders can sit back and relax. Getting in and out of the van is easy. 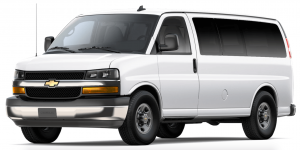 With low-leveled steps on the front and side doors, this van rental provides assistance for passengers who need it. 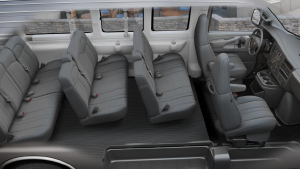 The 12-passenger model has an intelligent layout on the inside, too, so riders can easily move around the vehicle without disturbing other passengers. 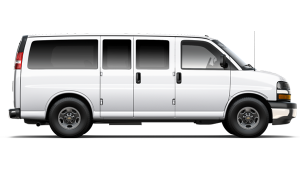 For weekend trips, weddings, church groups, sporting events, music tours or any other trips requiring large group travel, the 12-passenger extended van from Peter Fuller Rentals & Pre Owned is a fitting solution within the Boston area. 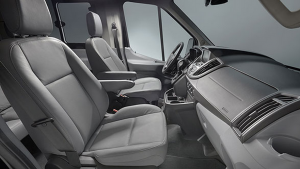 Our 15-passenger Ford Transit van rental are built on the same chassis as the Ford Transit 12-passenger extended van, but offer an extra row of seating. These rental vans are great for the largest of groups who want to travel together across town or across the country. Do you have cheap car rentals in Boston? All of our cars and vans are new model years, clean, and competitively priced. Our Watertown location is conveniently located just a few miles outside of Boston. Our Waltham location is just off of route 95, conveniently servicing the suburbs surrounding Boston. Will you direct bill my insurance company? Yes, we just need your claim # to set up a direct bill. We have billing arrangements set up with all Massachusetts insurance carriers. Usually these rentals can be set up so all charges are assumed by the insurance company.